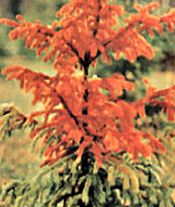 Winter injury to evergreens is rarely caused by excessive cold, but rather by desiccation or complete loss of moisture. Although water loss is naturally low during winter, drying winds extract precious moisture at a time when roots are embedded in frozen soil thereby making it very difficult for water lost through the leaves to be replenished by root uptake. Leaves and needles become scorched at the tips and along outer margins. Buds and twigs will become brittle and snap when bent. Oftentimes, the winter burn becomes more visible to the homeowner as spring approaches and the damage is done. Anti-Desiccants are 100% ORGANIC substances that form a thin, transparent film on leaf surfaces. This creates a moisture barrier over the plant's surface, holding water in place or slowing its outward movement. This film naturally wears-off at the end of the winter season. This treatment is especially important during drought conditions and other stress situations.